He's had many roles in career: champion body builder, Hollywood actor and even governor of California. 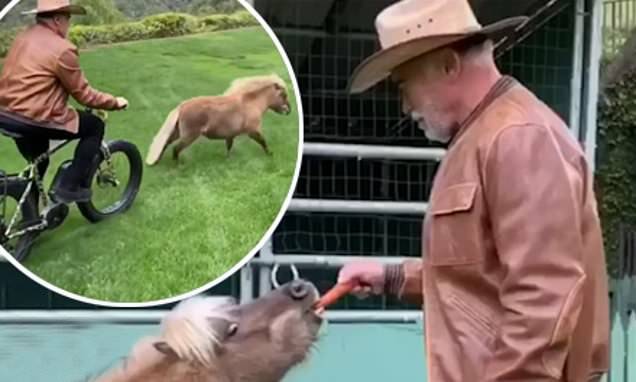 But, now Arnold Schwarzenegger, 71, has delighted fans by revealing that he is also a workout buddy to his miniature pony Whiskey. The star took to Instagram and TikTok (under the user name 'arnoldschnitzel') on Friday, to share a video of himself riding around after the tiny horse on a fat-tire bike. Sporting a cowboy hat, the Terminator star can be seen playfully chasing after Whiskey in his backyard. At the end of the short video compilation, Arnie feeds a carrot to Whiskey as his dog Gustav watches in the background.